Yes, you my interweb friend.Do you know what today is? It’s Christmas Eve. December 24th. Less than 24 hours before Christmas. Less than 24 hours people!When the heck did that happen? This is going to sound weird, but I kind of don’t want Christmas to be tomorrow. And, no, I haven’t gone crazy. Okay, maybe a little. You see, it’s only around Christmas time that certain things I loveeee (yes, with a few extra e’s) happen. Like, houses decorated with a million sparkly lights; fireplaces adorned with fuzzy red stockings; Christmas trees standing prettily in living rooms; snowman wrapping paper; Gingerbread Coffee; Salted Caramel anything and everything. Why do these things have to be seasonal? Can’t they be year round? Anyone with me? Anyone? I’ve gone all crazy bummed-out on you, haven’t I? I’m sorry. Let’s get back to being excited. Look. 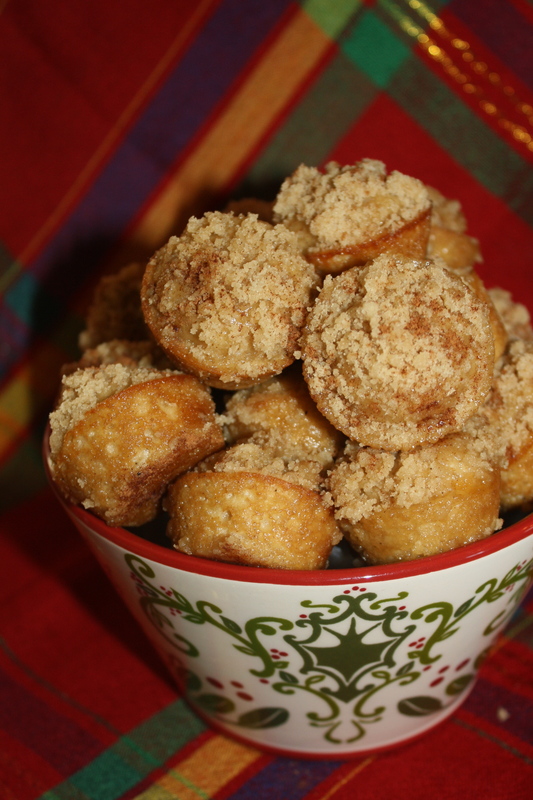 Baked Cinnamon Brown Sugar Donut Bites. Now, that’s exciting. I’m gonna tell you a secret. 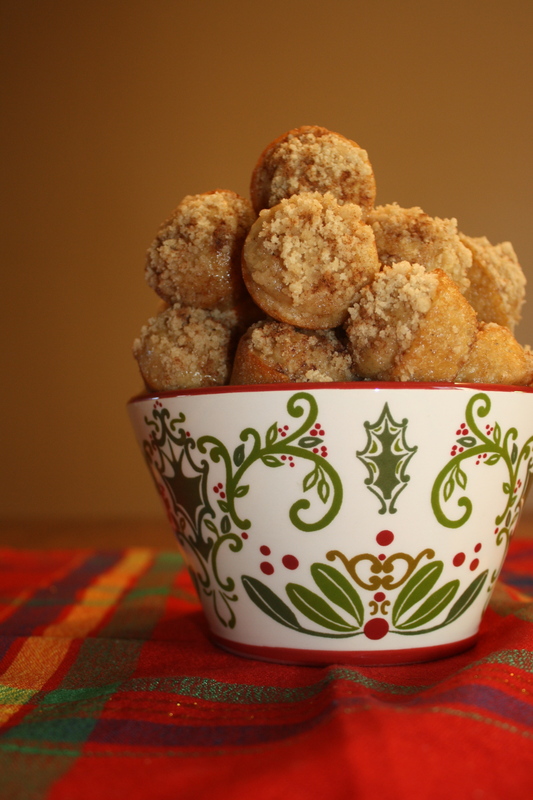 When I started baking these donut bites, I wanted them to be gingerbread donuts. I wanted them to be festive, and I wanted them to be in accordance with the season. 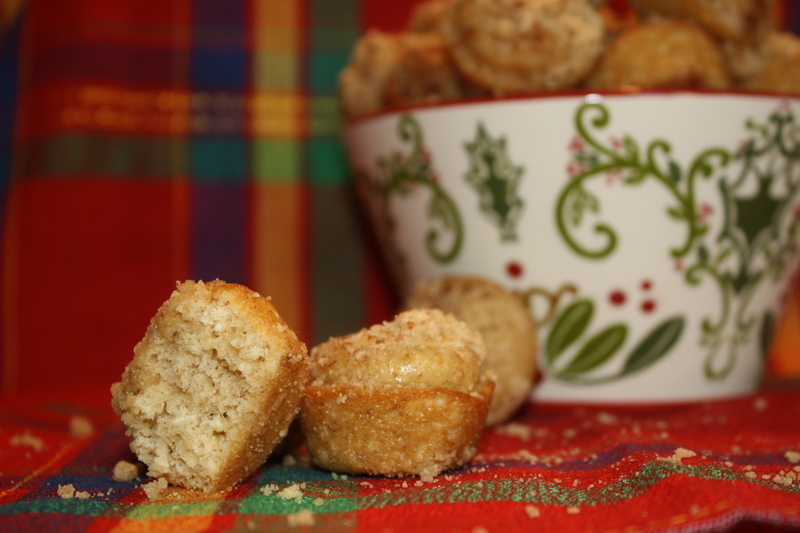 I even used a gingerbread donut recipe…but as you can see by the title, these little baked bites don’t taste like gingerbread. Sure, they have that spicy warmth you get from gingerbread, but to me, they taste more like cinnamon brown sugar heaven. Hence the title. These donut bites are baked (can I get a woot woot for saving your and my fingers from getting oil burns?) in a mini muffin pan, making them the perfect bite size treat. The donut itself is soft and moist, and filled with all those yummy warm spices. 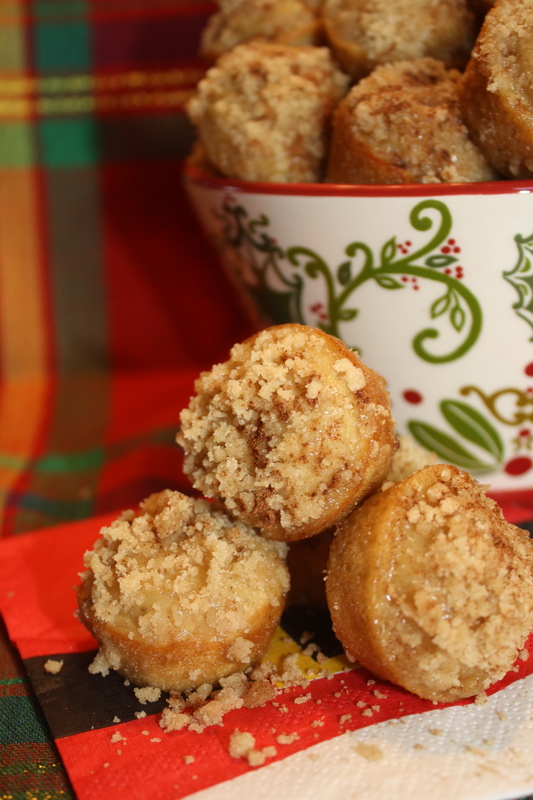 It is covered in a brown sugar glaze that soaks right into the donut, and is then topped with a brown sugar crumb topping and a little extra cinnamon. I may have wanted these to be gingerbread donuts, but I can’t even complain about the outcome…they really are pretty darn tasty! Preheat oven to 350 degrees and grease the wells of a mini muffin pan. Set aside. In a medium bowl, combine flour, brown sugar, baking powder, salt, cinnamon, cloves, ginger, and nutmeg. Mix until well-incorporated. Add milk, sour cream, egg, and butter. Stir until combined. Mix in maple syrup until just incorporated. Spoon two teaspoons of batter into each well of a mini muffin pan. Bake for 7 to 8 minutes or until a toothpick comes out clean. Let cool for about 5 minutes before removing from pan. In a small bowl mix together brown sugar and water until combined. Spoon glaze over each donut bite—make sure to cover the whole bite. Set glazed donut bites on a piece of wax paper. In a small bowl, combine brown sugar, flour, and butter—using your fingers works best—until it’s of a crumbling consistency. Generously sprinkle each donut bite with crumb topping before the glaze hardens, and then sprinkle with a little bit of cinnamon.